When my husband got orders to deploy in 2013, we did both the best and the worst thing we could have done. We decided that we would use the 90 days we had before he left to spend as much time together and make enough memories to get us through the 11-month tour. In our emotionally clouded minds, this seemed like a great plan. However, it was a flawed plan. First, you can’t replace the memories of 11 months of holidays, milestones, family outings, lazy pajama days, etc. When one of these occasions would arise, I didn’t think to myself “at least we stored up enough memories during those 90 days to get me through this speedbump.” Second, by the time he left, our lives were so intertwined that the void felt even larger and I struggled with finding my independence. The first couple of months after he left were consumed with addressing all of these challenges that were completely new and foreign to me. I took over responsibilities that had always been his. Managing a property that we didn’t live in, handling issues pertaining to his car, figuring out how to use my Power of Attorney so that I could even handle his affairs, health insurance, co-parenting his two boys from a previous marriage, etc. My plate was pretty full. I was at the bank dealing with some account of his when the clerk said to me, “I don’t know how you military spouses do it.” I looked at her and said, “I have no idea how they do it, either.” I was too overwhelmed to realize that I was now a part of that population. And then one day it changed. All of a sudden, I had figured out some things about myself, the people around me and the agencies available to help that suddenly made this experience manageable. Through a mix of formal and informal supports, the deployment became bearable. One Sunday in September, I was feeling particularly sorry for myself. I didn’t want to reach out to my friends because I assumed that they were already tired of hearing about the deployment. When I casually mentioned this theory months later, my friend told me that I was being ridiculous and they wanted to be there to support me. That’s important for other military spouses to know. Your friends and family want to help and support, but often don’t know how. Don’t convince yourself otherwise! Anyway, on this particular day, I knew that Zac Brown Band was playing locally and wanted to go, but decided against it since going to concerts is one of our favorite things to do together in the summer. At the last minute, I scored a front row ticket to the show for $40. I took it as a sign that I couldn’t stop my life just because he was gone. 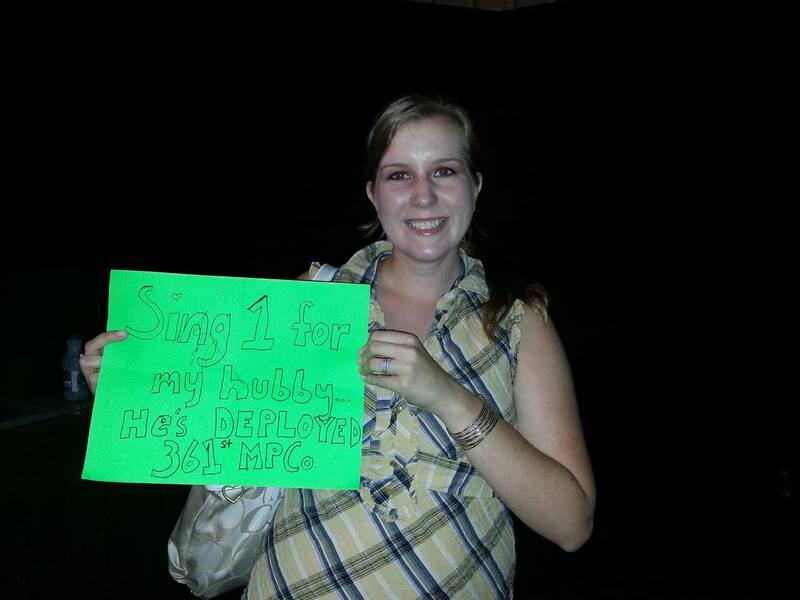 I still felt a little guilty about flying solo for one of our favorite activities, so in the parking lot I scribbled a sign that read “Sing 1 for my hubby… He’s deployed. 361st MP Co.” Zac Brown read the sign while he was on stage and then made eye contact with me and slightly bowed his head, as if to say thanks. That was awesome! It was even more awesome when he came down off the stage and autographed the sign! 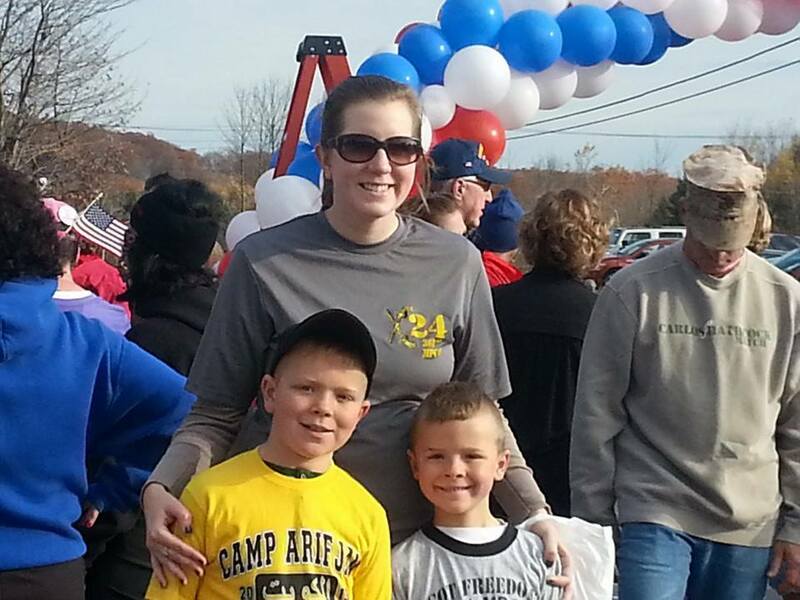 In November, I took my stepsons to a Wounded Warrior 5K. It was such a meaningful experience for all of us. Wounded Warrior is a charity that is close to our hearts, as we regularly donate for one of Chris’s fallen buddies. One thing I didn’t count on was the fact that my stepsons, who were 6 and 8 at the time, would want to actually run the 5K. I thought we were just there to walk. Needless to say, it was a few days before I could walk normally. 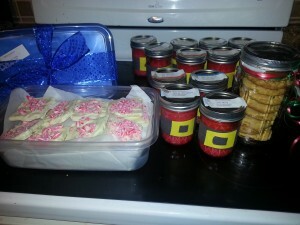 In December, I got together with one of my fellow Army wives, whose husband was deployed with Chris, and we baked for the unit. This wife and I became particularly close because we shared a common experience that nobody else I knew at the time had experienced. This bond was instrumental in my coping process. It was great to have a sleepover, pine for our soldiers over wine, and bake for hours. 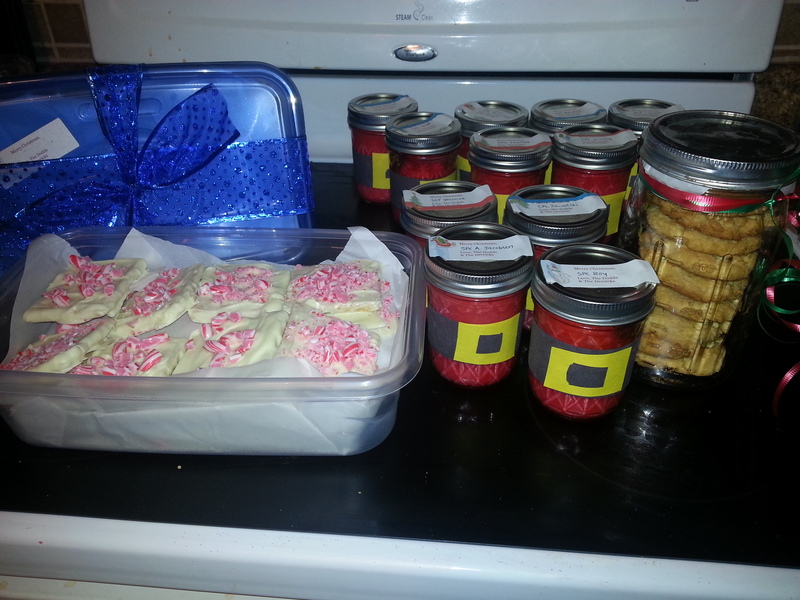 We made all of the soldiers in the unit a mason jar cake designed to look like a Santa suit, peppermint bark and peanut butter cookies. In February, my fellow Army wife and I spent Valentine ’s Day together at a Darius Rucker concert. We joked that we were deployment valentines. It was an especially crazy memory because it had snowed a lot that day and the logistics of getting to the concert were quite entertaining. However, we finally made it, after missing our dinner reservation, and wouldn’t you know it… we were able to get more autographs on my sign from Zac Brown Band. We added the Eli Young Band and the guitar player for Darius Rucker to the collection of autographs. In March, I had an extremely unique opportunity to meet my husband in Dubai. We had 7 amazing and fleeting days together. We are extremely fortunate because we got to see each other mid-deployment. Most troops don’t get this luxury, since deployments have been shortened to under 12 months. We also got to experience a beautiful place with a different culture that we might not have otherwise experienced. In April, I learned about Our Military Kids (http://ourmilitarykids.org/), an organization that gives grants to children of deployed service members, so that they can participate in an organized activity while their parent is away. The agency is specific to National Guard and Reserves families, which is great because there are fewer services dedicated to this population than to Active Duty. I was thrilled when my stepsons each received a grant to attend summer camp at the YMCA for 2 weeks. I was brought to tears by the acceptance package. The boys received a certificate for their service and sacrifice and their own dog tags. 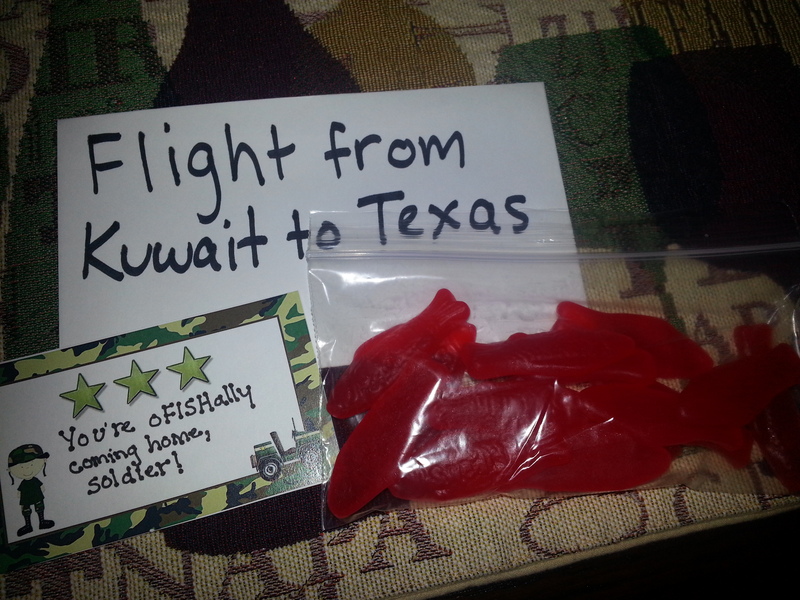 In May, I made a final care package for my soldier. It was interactive and some of my best work to date! Starting 1 week from the day that Chris would leave the Middle East, he got to open a new envelope each day. Each envelope contained a treat and a cheesy saying to go with it. He also go an envelope for each plane ride, out of country, home to New York. It’s a small thing, but it was really exciting for both of us to count down the days until he’d be home. In June, a month before Chris’ return, I found OpLove (http://oplove.org/). OpLove is an organization of photographers who donate their time and talent to capture the homecoming through pictures. Trish from OpLove was amazing. Not only did she take amazing pictures to commemorate this huge occasion for our family, but she also became the last bit of support I would need to get through the deployment. 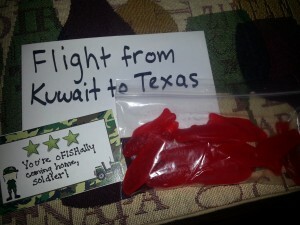 As is common with the Army, my husband’s homecoming plans changed multiple times. Through a series of unfortunate events, he was delayed over 5 hours, while the kids and I sat anxiously at the airport. Trish sat right there with me the whole time and said the right thing when I needed to hear it. Chris didn’t arrive until after midnight and both boys had fallen asleep on the airport benches. It was an emotionally draining day. I’m not sure I would have gotten through it without OpLove and I absolutely love the pictures that we ended up with. Now that we have put the deployment behind us and I have broken it down, it feels like it did go by quickly. But don’t say this to a military wife in the middle of deployment…ever! When you are in it, the days drag on. Only in hindsight can I recognize that it went quickly. I also must recognize that no two deployments are the same, and no two military families are the same. Now, I can reflect on the supports that got me through such a big obstacle. I’m filled with gratitude for my friends and family, who were supportive even if they didn’t quite know what I was going through. I’m thankful for my fellow military families, who know the sacrifice of service, but also know the love a service member that outweighs the sacrifice. I’m also thankful for the military organizations out there that do whatever they can, big or small, to support military families through deployment.